Fiberglass cutters, fiber cutters, cordless fiber cutter, electric fiberglass cutter, pneumatic scissor shears, rotary cutters, cutting mats. ES Manufacturing industrial strength design. Includes a rechargeable 9.6V long life nickel cadmium battery. Adjustable blade opening to 5/8" (0.60 mm) 10-sided high speed steel blade, with built in sharpening stone mechanism included. Great for heavy layers of fiberglass, but not Kevlar. Cuts marine carpet with ease. Includes one battery and charger. 12.5" long and weighs 2.5 lbs. 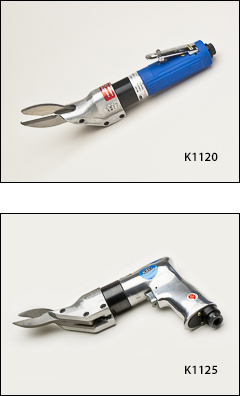 ES Manufacturing's heavy-duty cutter for heavy weight fiberglass materials such as chop strand, woven roving, bi-axials and tri-axials, but not Kevlar. Also cuts carbon fiber fabric up to .06" thick. 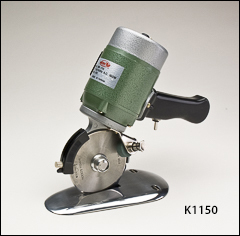 110 mm (4.25") 4-sided HSS blade with 1.25" capacity. Mounted sharpening stone. Our heaviest-duty cutter. 4 wheels on base plate for easy table top cutting. Adjustable guard helps limit blade exposure. 4" blade included. 0.25 HP motor. 110V. 11" long and weighs 7 lbs. Also available in 220v. 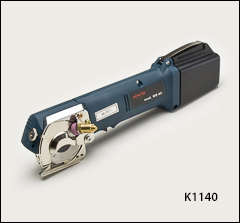 A cutter with a 50mm blade is also available, 110 or 220v. Contact us for more information. Kett's long-lasting production shears cut multiple layers of mat: 6 pieces of 2 oz chopped mat or 2 pieces of 24 oz roving. Same blades are on either a pistol grip style body or a straight handle, inline body for improved maneuverability. Large rabbit ear blades funnel thick, soft materials into the scissor's jaw without fouling or gouging. Easily cuts foam rubber, vinyl, mesh screening, and hardware cloth, but not Kevlar. 4 CFM. 1/4" air inlet, requires 90 PSI. K1120 straight-handled body design is 12" long and weighs 4 lbs. K1125 pistol grip design is 10.5" long and weighs 3 lbs. fit both shears listed above. Additional replacement parts for shears are available. Fiskars razor sharp blades for effortless cutting. Can mount for left or right hand use. 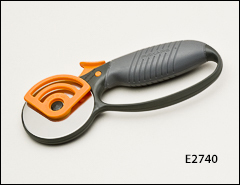 This cutter is not recommended for Kevlar or other aramid fibers. 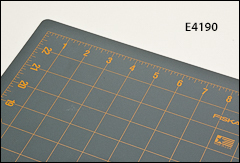 Fiskars reversible mats with self-healing surface and measuring grid on both sides. Extra room at edges so whole measurement grid appears on the mat.